Some of you are familiar with my long-time quest for the perfect pale lavender spinel, and I am so thrilled that we finally found THE stone! I had emailed Brad about a few of the colour change spinels that have come up in his drops lately, and he wrote me back out of the blue one day to let me know that one I had inquired about was available again. While the photos he sent suggested that the stone was darker than I wanted, he had included another stone to demonstrate contrast, and it just jumped out at me. I asked about it, and lucky for me he hadn't shown it to anyone yet, and it was absolutely PERFECTLY my dream stone! I immediately sent a note to my boyfriend, and crossed my fingers. Sure enough, months later, after waiting in agony (and hoping that things had gone my way since I never did see that stone show up in any of Brad's posts in the meantime), I was surprised with my stone set in a lovely white gold solitaire while we were home for the holidays. The setting is temporary for now, but we are going to take our time selecting it's forever home, and possibly wait until an anniversary to choose the right one. It's a lovely pillowy cushion shape, portuguese cut, and just sparkles like crazy! The colour shifts in tone and saturation to show more pink or blue depending on the light source, but it's always bright, and even takes on this glowing character sometimes. My favourite is in diffuse sunlight - the saturation is low, and the most lovely lavender with no grey at all (that is nearly impossible to photograph). It gets mistaken for a purple diamond all the time. Hounddog, Lykame, Arcadian and 13 others like this. Perfection and congratulations on both the engagement and ring. WhitePeonia, Lykame, Alex T and 2 others like this. My heart just skipped a beat - that stone is just to die for! And, I love the elegant setting - do you mind sharing where you found it? Just goregous all around! you held out until "the one" spoke to you! and it is lovely on your finger! Your spinel is a show stopper! Love it! Thank you Chrono, VapidLapid, endless_summer, movie zombie and armywife13!! My fiance found the setting all on his own (in fact he was still asking me to work on a pinterest board the very morning that he engaged - I was completely surprised) at a local jeweller. He has always been partial to solitaires, and while there are a few things I would like to change (it's set quite high for me, and the prongs could be more delicate), I love that he chose this one all by himself so we'll keep it until we find/design something else that suits us both. WOW!!!!! More than a little jealous, I must say! Congrats on the engagement and the beautiful stone! Congratulations!! Very lovely lavender color...it looks great on your hand. What a stunner--so glad you got what you wanted! BTW, your hands are gorgeous! No one can walk away from that darling! That is the most beautiful lavender spinel I have seen! I love it - add me to the total jealous pile of PSers. You know there will be a total rush on Brad now. More importantly, congratulations on your engagement, pb! Wow! Congrats! 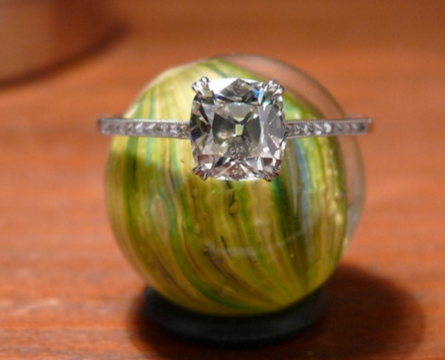 That stone is perfection, and I just LOVE me a nice solitaire! More Pics! MORE PICS!! MORE PICTURES!!! Thank you so much NKOTB, MrsM, canuk-gal, OTL, ForteKitty, soberguy, minousbijoux, Kelli and katharath!! I'm so obsessed with it... I wish I could actually capture how sparkly it is in photos! It was so serendipitous the way the stone practically "found me" through Brad. I'm SO lucky!! The height of the setting is taking some getting used to, but I love seeing the entire stone! I might see if I can have the stone lowered slightly, and the prongs pointed, but the stone is ever so slightly askew in the setting so I'm reluctant to take it back to the original jeweller in case it gets further mis-shapen. Lykame and MissyBeaucoup like this. Wow, that is insanely beautiful!!! I've never wanted a lavender stone before, but seeing this - WOW!!! elliefire99 and Rare gem lover like this. Beautiful ring, I love the sparkle of a portuguese cut, congratulations! It's lovely petit! I'm so happy it's yours! DANG!!! That looks awesome! Better in your photos than in the vendors! I'm SO happy for you. Quite a holy grail stone. Well done. AV_, Lykame, partgypsy and 1 other person like this. Thank you Jereni and artdecogirl! Velouria - thank you!! It definitely is my holy grail. I still can't believe it's mine!